This has been a hit in our home for as long as I can remember. Simple, which sometimes is the best. Heat oil in skillet over medium heat. 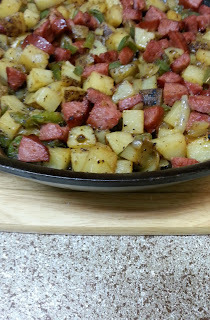 Add smoked sausage, sauteed until brown. Remove sausage from skillet and set aside. Add potatoes, onions, bell pepper, seasoned salt, black pepper and garlic powder, stirring. Cover, and cook until potatoes are tender, stirring often. Add smoked sausage back to pan, cover and heat through, about 3 to 5 minutes. Enjoy! Note: Serve with cooked cabbage, fried or scrambled eggs or all by it self.